President of the Senate and Director General of the Peoples Democratic Party (PDP) Presidential Campaign Council, Dr. Bukola Saraki, yesterday called on Nigerians to vote in large numbers on Saturday. 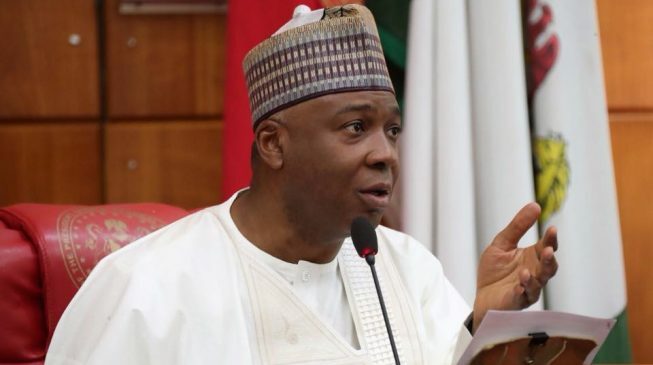 In a statement by his Special Adviser on Media and Publicity, Yusuph Olaniyonu, Saraki noted that, “with a high voter turn-out, the results of the election cannot be manipulated. “We have all seen how the last four years have gone. It is time for Nigerians to choose economic growth over poverty; choose security over the growing and fast spreading insecurity; and choose competent leadership over leadership that is outdated. The Senate President also called on all young Nigerians of voting age to see the election as a test of the strength of their numbers, adding that with 51 percent of the voters on the register being youths, they make up the most crucial voting bloc. He said: “If you vote, they can’t rig! The more people that come out to vote, the less likely it is for those that want to manipulate the results to do so. In another development, Minister of Labour and Productivity, Chris Ngige, vowed that any attempt by the PDP to allocate results during the presidential election in the South East, would be resisted by the APC leaders in the region. Ngige, who hails from the same state, Anambra, with the vice presidential candidate of the PDP, Peter Obi, is a member of the APC. He spoke to journalists in Abuja at the weekend. He alleged that in 2015, results were allocated to the presidential candidate of the PDP, Goodluck Jonathan. He also alleged that security agents were used in taming members of the opposition. He said: “Yes, the PDP has a Vice Presidential candidate from my zone and I can tell you that it won’t be easy for them. See, politics and winning of election are all about calculation and strategic positioning and measured steps towards a direction. “Two things are happening; in 2015 election there was no voting in most of the South East and South South. Votes were allocated. The card reader hadn’t become functional. It was just new and it can be tampered with and at the end of the day, most votes were allocated. “In 2015, they took police, army, navy everything and armoured tank and drove us away. In fact, they put a price on my head when I was going to the collation centre. “Secondly, the Vice President of the PDP is former governor Peter Obi, my successor in Anambra State. I can tell you that those who are shouting that Obi is this and that are the elites who are looking for one thing or the other and people who don’t believe that Muhammadu Buhari has done something good in their lives because he is already building infrastructures for them. They want money. “They want all the monies that have been trapped by the TSA to be pushed down again on the table for them to start taking. That one is no longer possible. “Peter Obi hasn’t been a wonderful governor as people expected him to be because I am the one to tell you because I know what I handed over to him. He is making noise that he handed money over to Obiano. “I was the first to leave money. I left N13.8 billion cash in the bank and I am not counting the bank shares we bought and dividends, but because of propagandists, they shouted that he left N80 billion for Obiano and I left a lot of infrastructural work done. “Federal loans of which he received close to N15 billion as refunds after my tenure. I was the first person to handover schools to the missionaries in Anambra state. I built more than 880KM of roads. “If you go there today, you will see the roads I built 15 years ago. They are still standing and most of them have no single potholes because I used first class contractors. “So for people to say because he chose Obi this will happen is false. Nothing will happen. If anything, Peter Obi has no influence in South East apart from Anambra. The PDP, however, charged Nigerians to be ready to defend their votes. Its National Publicity Secretary, Kola Ologbondiyan, gave the charge at a press briefing in Abuja, yesterday. He said, “the entire world is aware that Nigerians have reached an irrevocable consensus on Atiku Abubakar as the next President of our country.